A quick look at exporting retina ready images using the compressive JPG technique. We’re going to explore how to export images so they’re clear on retina screens. The technique we’re going to look at is called “Compressive JPGs”—essentially we make them double the width and scale them down while significantly reducing the quality. Start the lesson by forking and cloning the retina-images repository. Fork & clone the “retina-images” repo. To get started on this project we need to download a few PSDs to use on the website. Notice how the PSD files are not inside our Git repository, they’re in a folder beside the Git repository named prod. Creative Suite documents never go inside your Git repository! So first, open up the index.html into your browser—you should see two placeholder images. We need to determine the maximum width the images will ever be. But we first have to pick a maximum size we want to view the site at. Since we’re using an xl size media query, 90em, in most of our websites let’s use that as the upper limit. So resize the window so it’s exactly 1440px. With the correct dimensions we can now resize the images so they match the retina width we want. With the images properly sized we’re now going to export them properly with “Save for Web”. The important part of exporting when making compressive JPGs is to make the quality really low, 20% low. Since the images will be scaled down by the browser the quality degradation won’t be noticeable. Because performance is probably the most important design consideration for The Web we need to make sure the images are as small as possible. 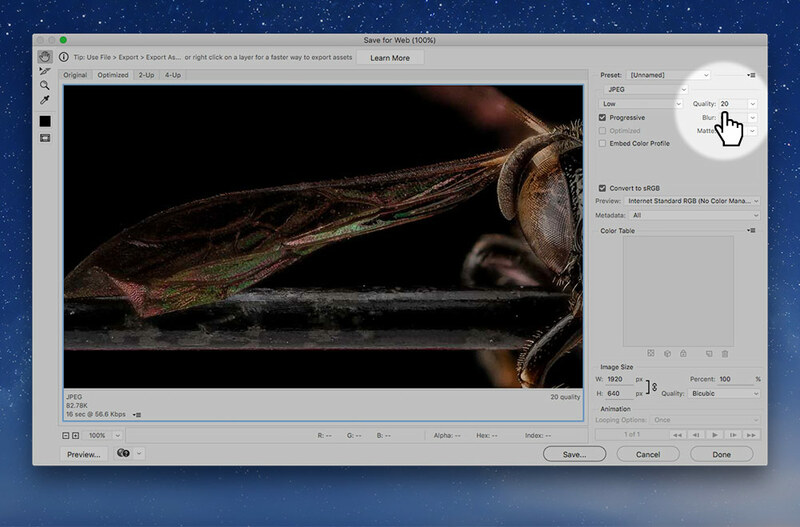 Drop ’em into ImageOptim and remove all the extra cruft from the JPGs so they can be as small as possible. Finally we’ll point our HTML to the new images.